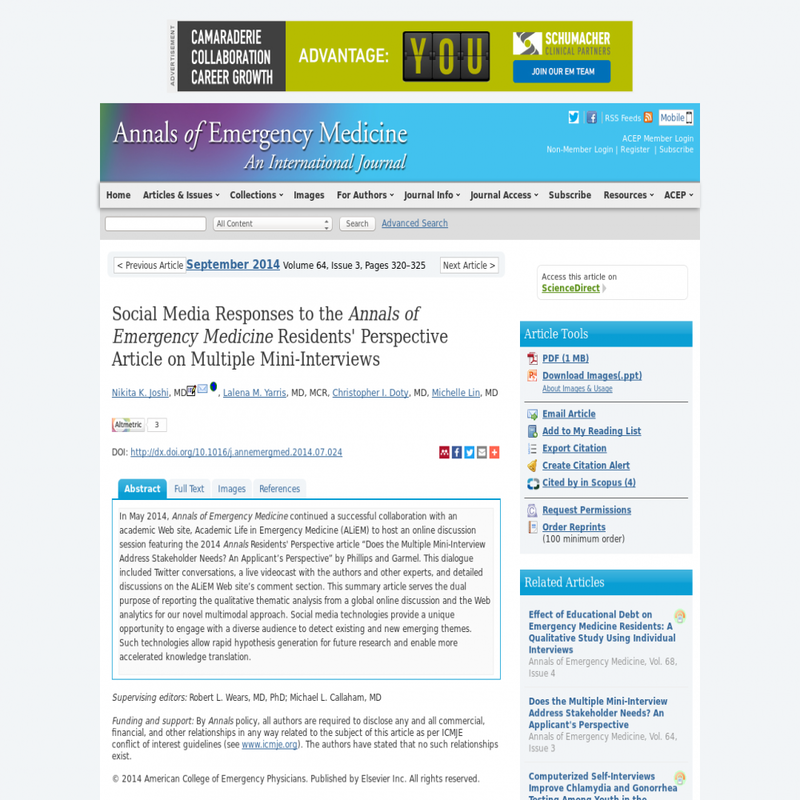 In May 2014, Annals of Emergency Medicine continued a successful collaboration with an academic Web site, Academic Life in Emergency Medicine (ALiEM) to host an online discussion session featuring the 2014 Annals Residents' Perspective article "Does the Multiple Mini-Interview Address Stakeholder Needs? An Applicant's Perspective" by Phillips and Garmel. This dialogue included Twitter conversations, a live videocast with the authors and other experts, and detailed discussions on the ALiEM Web site's comment section. This summary article serves the dual purpose of reporting the qualitative thematic analysis from a global online discussion and the Web analytics for our novel multimodal approach. Social media technologies provide a unique opportunity to engage with a diverse audience to detect existing and new emerging themes. Such technologies allow rapid hypothesis generation for future research and enable more accelerated knowledge translation.